This Lorain County Metro Park features 65 acres of mature woodlands and floodplains, a 1.2 mile paved loop-trail and day-use area with a shelter available for reservation, playground, soccer field and visitor’s center. Whether you are looking for a place to a have a picnic, let the kids run free or just want to walk the paved trail from creek bed to pine grove, come check us out! Just inside the entrance you’ll find the day-use area—a great place to set up a picnic, let the kids play on the play set, watch a game of soccer or toss a Frisbee. The visitor’s center features a rustic, open-beamed ceiling, gas fireplace and offers natural and recreational programming at pre-scheduled times. An attractive wooden deck behind the building offers a view of the Beaver Creek below and all the wildlife and wildflowers you’d expect to find in a this little escape to the natural world. The meeting room is reservable for both private and community use. The .75 mile loop trail takes you back where you started, but the trip is well worth it! In a short distance this charming trail starts high along a ravine that overlooks the Beaver Creek and gradually descends to the water’s edge. Farther along you’ll ascend to a large cathedral-like grove of pines that rise like spires into the sky. On the way back you’ll cross the creek again at a second scenic bridge that will certainly make you pause before heading back to the car. Over the last 10,000 years since the retreat of the last glaciers, the Beaver Creek has carved this area into a diverse range of uplands, rolling hills and 30 foot cliffs. Spring wildflowers grow abundantly throughout the area and include spring beauty, cut-leaf toothwort, adder’s tongue and jack-in-the-pulpit. Hardwoods are typical of the region and include a variety of oaks, maples and ash. The southern uplands is marked by large groves of red pine, Norway spruce and red cedar, none of which are native to the area but were planted 50 years ago. Aquatic life is plentiful as well and includes fish, frogs, turtles, crayfish and insect nymphs along the creek bed. You should also see resident mallards and an occasional blue heron as well. Fishing for steelhead in the spring has become a popular activity along the Beaver Creek as well. Amherst Beaver Creek Reservation has the distinction of being the first joint effort between a city and a metro park in the state of Ohio. 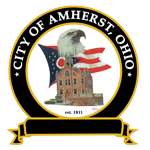 Two-thirds of the funding came from the Metro Parks and the City of Amherst, with private donations making up the last third. This three-way effort raised the 1.8 million dollars needed to make this park a reality. It opened its gates to the public on July 1, 2001.